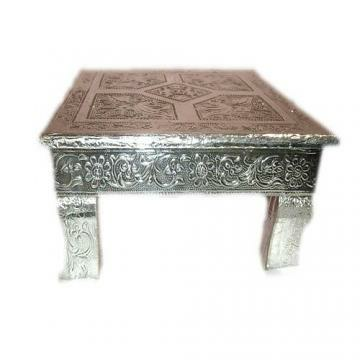 This is an all aluminum silver color bajot table (chowki) with carving in traditional pattern. Use it in your puja ghar as a base for setting up hindu god deity. It can also be used as as a small stool for eating, home décor or at wedding. Buy Carved Aluminum Bajot / Indian Table (Chowki) - 3 Sizes, sold & shipped by Sangu Enterprise Ltd where you can shop online for Indian Restaurant Supply, Pooja Mandir, Handicrafts, Utensils & Gifts. This Pooja Table Chowki collection has been tagged as Indian Handicarfts, Hindu Religion, Artwork, Furniture, Metal Chouki Chawky, Wedding Home Mandir Temple Decoration Temple, Puja Room Decor, Chowki Table. What is the height of this ? I have a 10 inch, round silver tray on which I keep my Guru's sandals. I bought the 12 inch Chowki to hold them. I wanted to put them out at satsang in front of the Guru's puja and I didn't want to put the tray on the floor. The size was perfect and the height is just right. The table is very shiny, which is what I wanted and I like the embossing. I would post a photo if I could. But I don't see anyplace to do that. It is just perfect and I am very glad I took the chance to order it without seeing it in person. Nice bajot. Arrived on time with no damage. Looks the same as in the picture shown. The bajot is beautiful and finishing is perfect! We liked the chowki which we have received 2weeks ago.we liked your service as well , it's too good and reliable.